Events | Out of the Box! 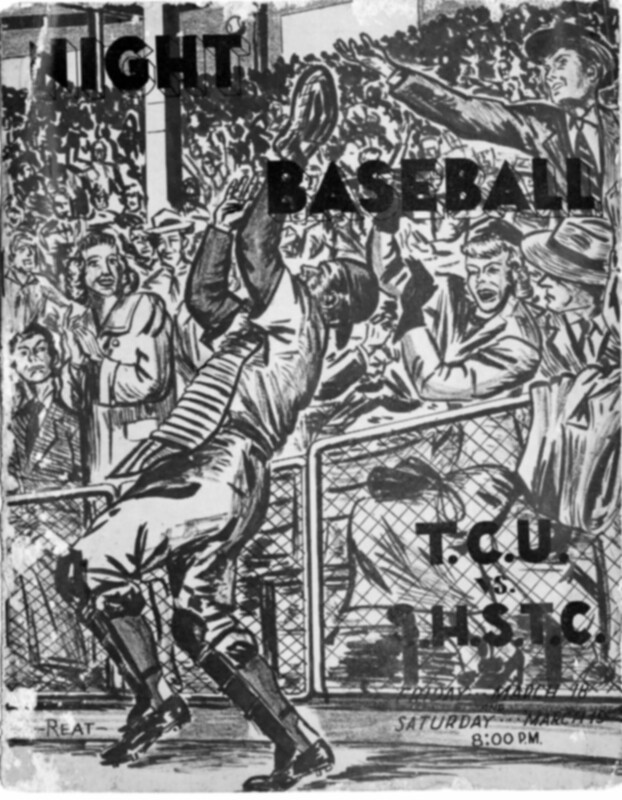 One of the most recent acquisition of the SHSU University Archives is this 68-year-old baseball program from March 18-19, 1949. The BearKats played their first two home games against the TCU Horned Frogs. The final score for the games was March 18, 8-5 to the Frogs and March 19, 9-8 to the Frogs. Although they did not win, the BearKats were playing on a brand new baseball diamond. The Josey Vocational School dirt moving class who called the job, “Operation “fill-up,” constructed the field. This swampland turned baseball diamond later became Dewitte Holleman Field where the BearKats would play until the Don Sanders Baseball Complex was finished in 2006. 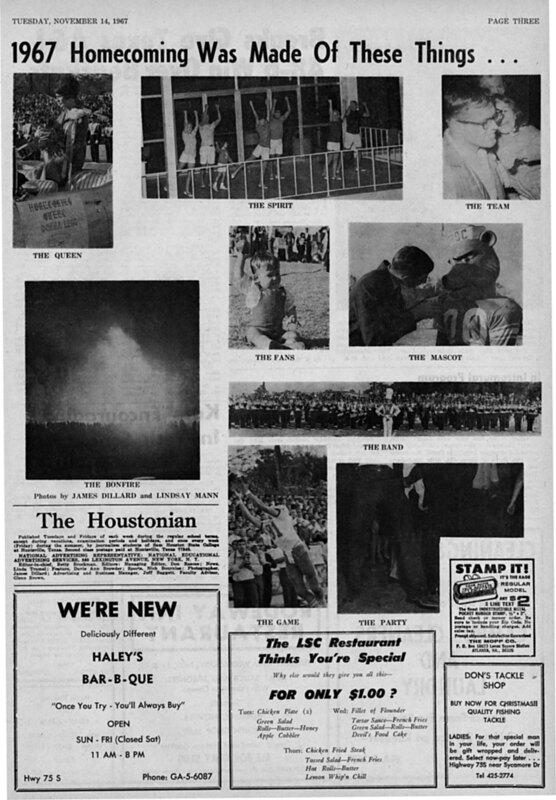 To find out more of the history of SHSU Baseball or Dewitte Holleman Field come visit the SHSU University Archives. 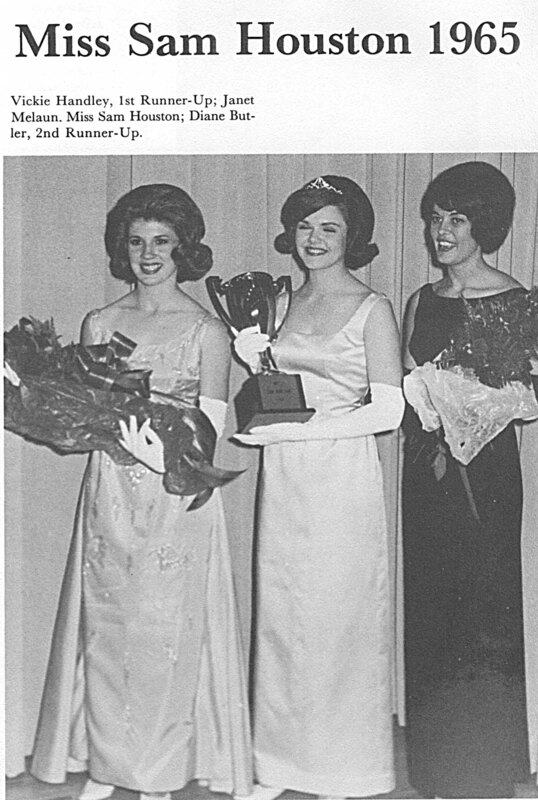 The Miss Sam Houston pageant has been crowning lovely ladies for over 50 years. 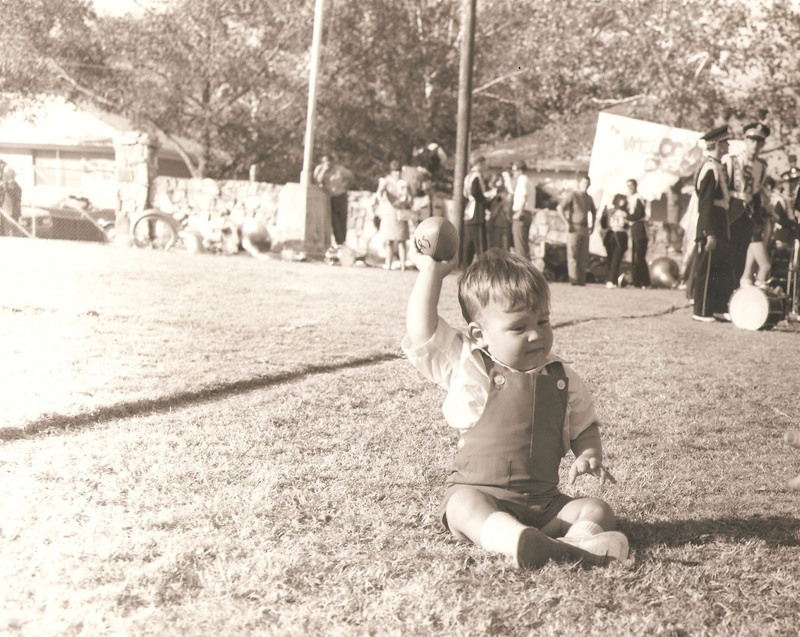 This photograph from The Alcalde shows the Miss Sam Houston court from 50 years ago in 1965. Janet Melaun of Dallas, who was a music education major, was chosen from 19 candidates. The theme for the pageant was “007” from the James Bond movies which were very popular at the time. Come visit the University Archives to learn about Miss Sam Houston pageant history and other SHSU beauty contests over the years. The University Archives is in room 400 of the Newton Gresham Library. 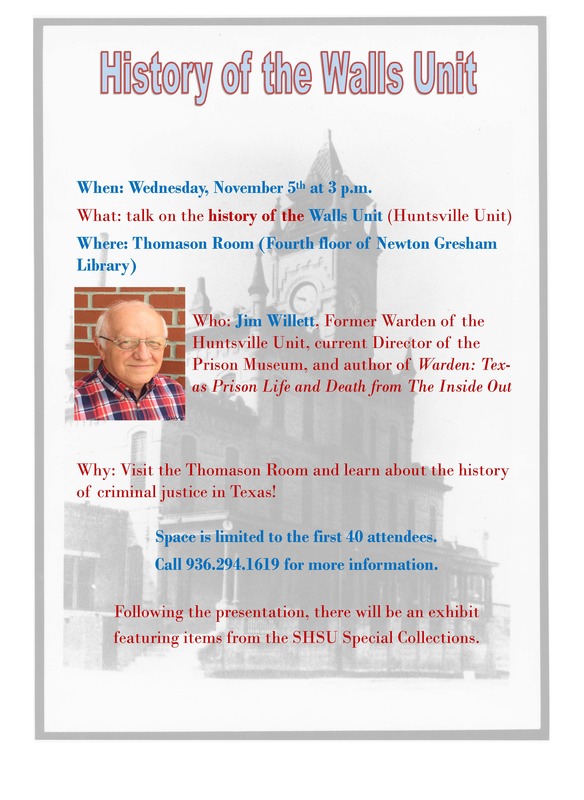 On November 5th at 3pm in the Thomason Room, SHSU Special Collections will be hosting a talk by Jim Willet, Former Warden of the Walls Unit and Director of the Texas Prison Museum. The Walls Unit (Huntsville Unit) began operations in 1849 and is the oldest building in the Texas prison system. The unit remains attractive to this day and currently houses the State of Texas execution chamber. 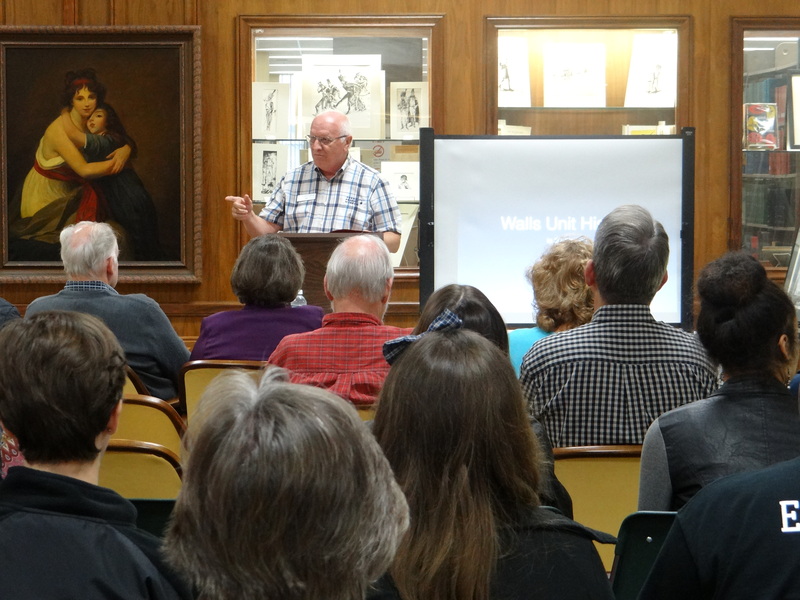 Willet will discuss the history of the unit and his time overseeing the execution of inmates. After the talk, attendees will be able to view exhibits featuring items from a number of high profile criminal justice manuscript collections. 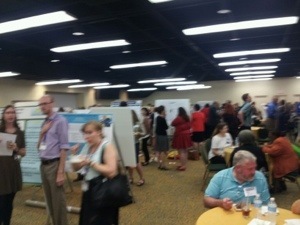 Staff members will gladly answer questions about these collections and help you find potential resources for research. If you are interested in Criminal Justice or the history of the Huntsville, then this is the event for you. Because of the size of the Thomason Room, space is limited so get there early for a seat! 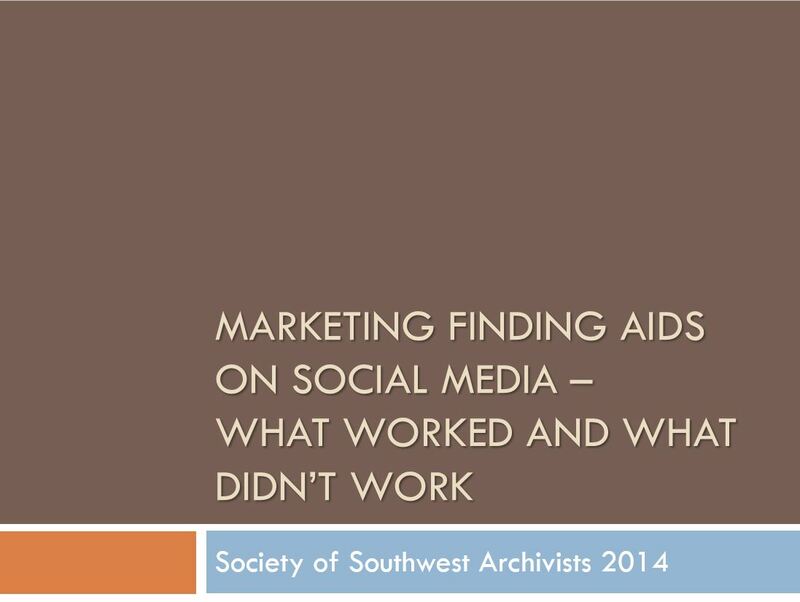 On May 29, 2014, Scott Vieira, James Williamson and Felicia Williamson presented “Promoting Finding Aids on Social Media: What Worked and What Didn’t Work” at the Society of Southwest Archivists Annual Conference in New Orleans. 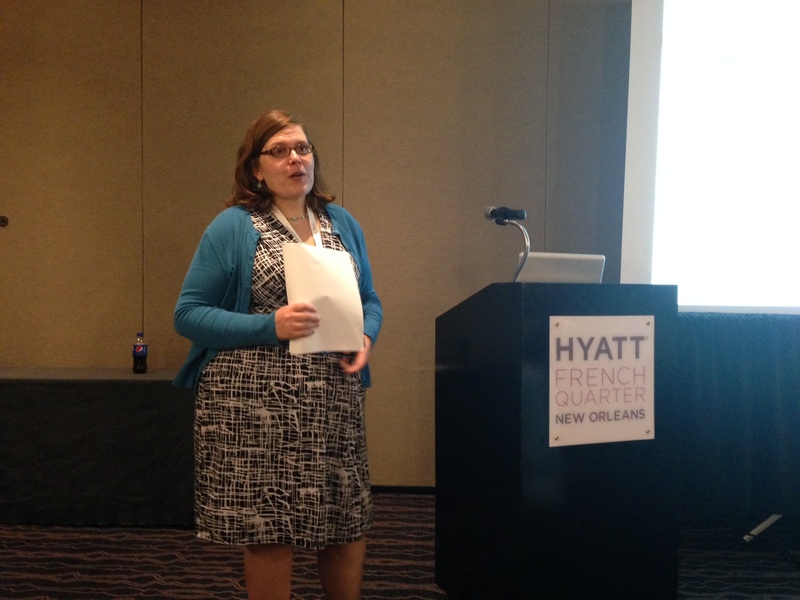 The presentation centered on the findings of our yearlong project during which we attempted to determine whether social media sites could be used to promote the use of finding aids from our Archon website (https://archon.shsu.edu). We also wanted to know if certain sites were better the others at promoting the use of our finding aids to conduct in depth archival research. Our presentation generated a great deal of positive feed back at SSA and we are happy to share our PowerPoint, which can be viewed at the link below. We are currently working on a journal article to be published (we hope!) next year. 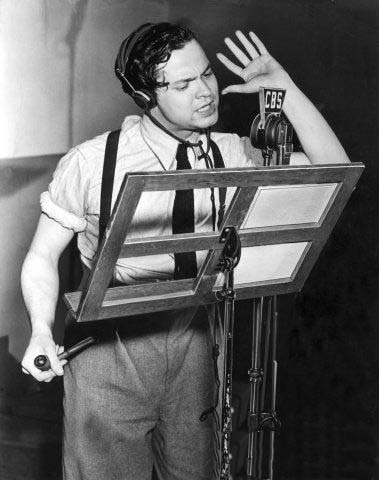 75 years ago, the famous Orson Welles radio production of HG Wells’s War of the Worlds was broadcast on CBS radio. The broadcast which many thought was real caused a large panic in the Northeast and parts of Canada. While a large number knew it was a drama, listeners who may have missed the introduction or were channel surfing fell for the bulletin laden format of the show. The library owns a copy of The Panic Broadcast by Howard Koch which provides some details of the broadcast. Thomason Special Collections also has a large collection of works from HG Wells including several 1st editions. Hey everyone since day 6 was only the morning, I thought I would just go ahead and roll it into day 5 of SAA ’13. Today we got up slightly earlier because the panels started at 9:30 instead of 10:00. 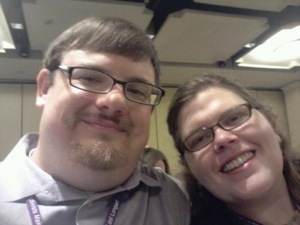 Felicia and I actually attended the same panel — which is somewhat unusual for us. The panel was “Part of the Process : the When, Why, and How of Routine Digitization.” Digitization is a big part of what we do at Sam and we are always looking at other examples to see if there are things that we can do better. This panel certainly provided an interesting view of digitization. Each panelist talked about how digitization fits into their workflows and effects the processing of the collections (organizing each collection). One presenter did things the standard way by digitizing at the end of the process while the other digitized somewhere in the middle or near the end. We follow this approach. Felicia processes a collection at Sam Houston then I digitize the collection using the order and arrangement she has chosen. I use this order to reflect the collection in a digital environment. It creates a connection between the collections in both physical and digital form. In contrast, the last presenter on this panel does things very differently. She worked at a experimental library that digitized at the beginning and didn’t really process at all because the way archivists currently organize materials is not really how researchers search and use online materials. The digital environment dictates the order of the collection. Felicia and I really didn’t get it but argued about it for 15 minutes — talk about nerd love! I am not sure if its something we want to do at Sam Houston but I would love to see how it goes for this library. For me the afternoon was dominated by data preservation. 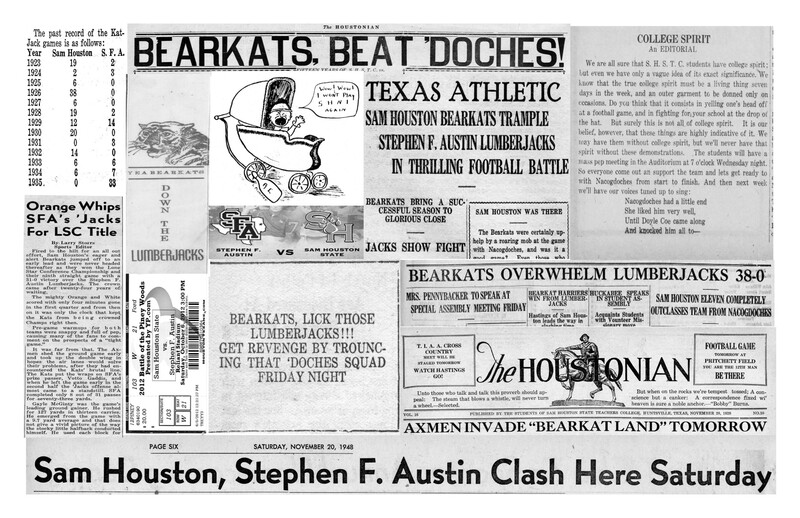 Sam Houston has decided to tackle our archival digital records that are on physical media. We have business records, photographs, etc. stored on things like cds, dvd, magnetic tape, and hard drives. We have to find a way to remove this items from the media and place them in a safe environment to make sure researchers can use them in the future. Sam Houston took part in the Jump In Initiative which challenged institutions to begin the first steps to managing these digital records. Sam Houston completed the challenge and wrote about the experience. 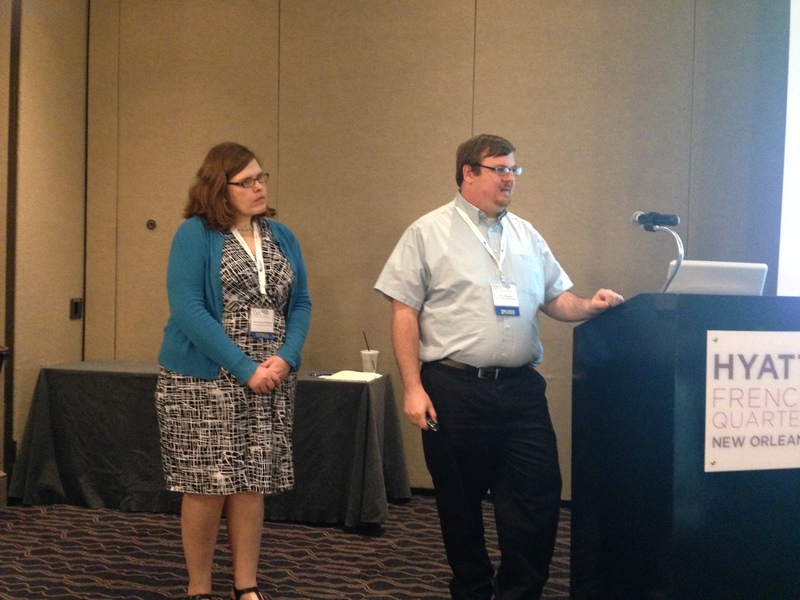 I then participated in a discussion about the initiative at the Manuscript Repositories section meeting. It was a fun experience and I was glad to contribute in some way. 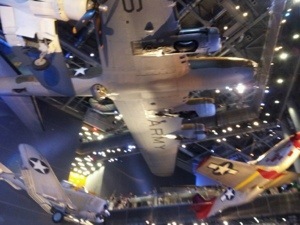 At 6:50pm, we headed out to the All-Attendee Reception that was held at the World War II museum. The event was catered by John Besh’s American Sector restaurant. We had muffaletta and sloppy joes plus a number of wonderful items. 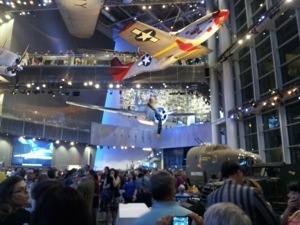 It was a fun evening as we reconnected with friends and colleagues under giant WWII planes. Well, this is the end. Sort of. We had one more panel before we called it a day. 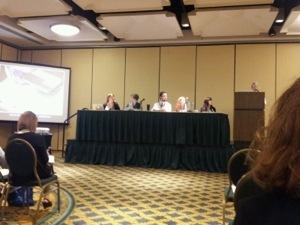 The panel was on descriptive standards and how they can apply to digital objects. When people talk about born digital/ digitized material, they rarely talk about how to describe them in ways that users can understand. When they do, it is in very general terms. This panel tried to broach the topic with only an hour and 30 minutes. We found some of the presenters informative and felt like Sam Houston was on the right path with how we describe objects online. Hooray!! Now it is the end! 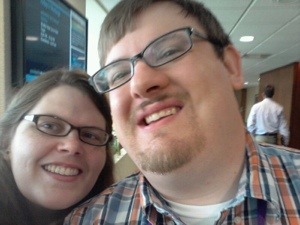 We quickly packed and checked out of our hotel. Its a 6 hour drive to Huntsville which gives us plenty of time to sing along in the car. Thanks for reading! I hope you enjoyed our small adventure. This blog will return to its regular awesomeness next week. Well today is the day. SAA officially started. I attempted to tweet about the panels but listening and typing, if only 140 characters, is tough. 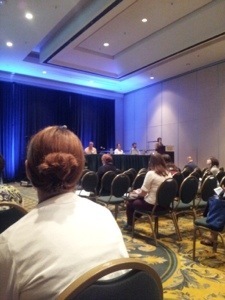 While Felicia attended a panel on MPLP, I headed over to the panel on cloud storage for born digital materials. I am interested in cloud storage because it seems like a great fix (cheap, away from your institution, frees up resources), but I just have a hard time trusting the some of these large companies — specifically Amazon — will have my interest as a digital archivist at heart. Their goals may align now but it could change. The archivist on the panel seemed to have found success in a number of different ways so maybe I should educate myself some more. Maybe my thoughts are wrong. Felicia and I traveled a good .5 miles down Poydras St. to eat at Luke’s off of St. Charles. It is a John Besh restaurant so we had high hopes. It was delicious. 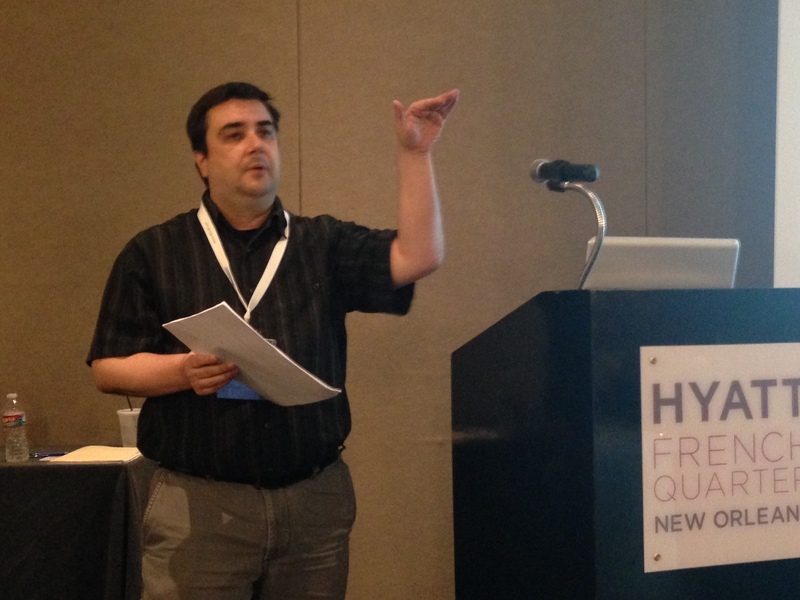 I decided to attend the Brave New World: The intersection of Institutional Repositories and University Archives. It was good. They skipped presentations and went pretty much went straight to discussion. A real highlight of the conference so far. One of our goals at Sam Houston (at least in the library) is to create a institutional repository. These IRs naturally come into conflict with the collecting of University Archives so I think it is necessary for those involved is to clearly define the roles of the IR and University Archives before things get rolling. We attended two big parties. The first was the grand opening of the exhibit hall. At this opening, the vendors try to sell their services. You listen and sometimes they give you free swag. We also got a chance to enjoy some Louisiana cuisine like seafood gumbo and red beans and rice. Staples of the Louisiana diet. Afterward, we journeyed to the LSU alumni mixer. We saw many of our old friends from school. It was great to catch up. I am so disappointed that I didn’t get any pictures. The party also acted as a celebration for the retirement of Dr. Elizabeth Dow from LSU. Both Felicia and I attended LSU to earn our degrees in library and information science. We also worked as graduate assistants for Dr. Dow and took many of her classes. She has been an important part of our lives– offering guidance and an opportunity to advance in the archives field. Three cheers for Dr. Dow! 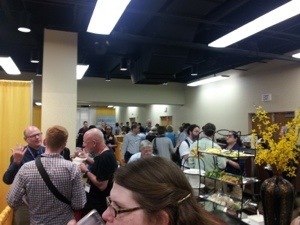 On day 5, the conference will continue with more panels and free food.